The software is designed to prepare the user for the Certified Case Manager Exam (CCM Exam) offered by the Commission for Case Manager Certification. 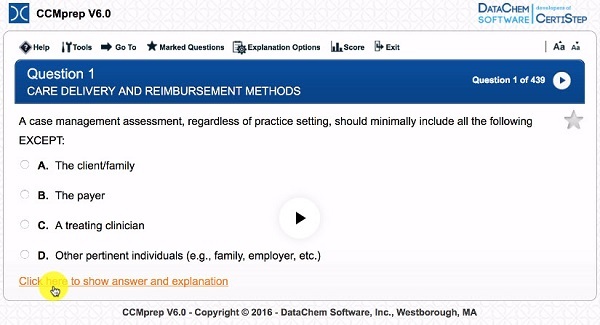 CCMprep V6.0 was authored by a team of certified case managers and registered nurses. Sandi is Owner and President of CCMI Associates. Since 1986, Sandi has provided case management consulting services to over 250 organizations and trains over 500 case managers annually. She is a past president of the Case Management Society of America (2000-01) and founder and past president of the Case Management Society of New England. Sandi was an adjunct faculty member for case management and health care for the University Systems of New Hampshire and was a clinical preceptor for case management at the University of Massachusetts in 1996. She is an advisory board member for Professional Case Management and The Case Management Advisor. She was also recognized as the “Case Manager of the Year” in 1995 by the Case Management Society of America and as the “Case Manager of the Year” in 2006 by the Case Management Society of New England. In 2002, Sandi was a member of the National Task Force on Case Management for Standards of Practice. Sandi has a BSN from the State University of New York. "I used the DataChem software and passed the test on 4/30/18. Absolutely loved your program. I attribute my success to your program." "Thank you so much - I passed the CCM exam!!! DataChem definitely helped me for sure!" "I took the National Case Management exam and I passed!!! with much help from the DataChem online test questions. That is the second time I have used DataChem.. in 2005 I got the CRRN CD and I passed that as well. Thank you so much. I always recommend DataChem!!" "Just took my CCM test on 4/21/18 and passed! Your questions with the rationale answers not only helped but it allowed me to re-read each question and critically figure out what it was asking and then narrow out the best answers to that question and then by reviewing the rationale answer, I was able to see what I needed to improve on. Several questions or very close to its content were on my exam and helped me to feel much more comfortable. My only regret is that I started your software three weeks ago and not sooner (I kept putting it off). I have to tell you that I crammed as much info as I could in those three weeks and it worked! Thank you so much!! Best money I could have spent! It's not only knowing the correct answers to the question but truly understanding what is being asked and then narrow down to the best possible answer, this software helped!" "I just passed my CCM. Thanks! !